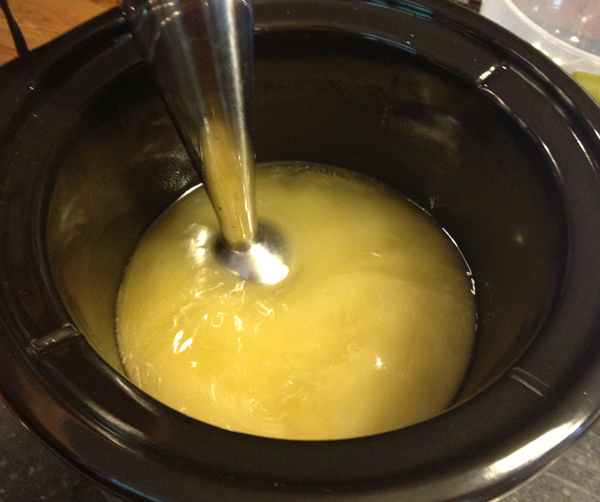 Glycerin Method Liquid Soap Making. The most common method for making liquid soap involves adding Potassium Hydroxide to distilled water to make your lye solution. Glycerin can be substituted for the water in liquid soapmaking. Glycerin speeds up the saponification process so that you achieve the various stages of creating your paste much faster and cuts down on the hours upon hours of cooking time. I also find that diluting the paste made using the glycerin method is also a much quicker process and often require less dilution water. The glycerin method is also very forgiving and almost foolproof as long as your recipe is run through a lye calculator so that you have the correct amount of Potassium Hydroxide (KOH) for your oils. Brambleberry's and Summerbee Meadow's Lye Calculators using a 0% - 3% superfat (make sure to set it to Liquid Soap) have never failed me either. As with any soapmaking method, there are a few basic rules but beyond that, everyone has there own techniques and methods to achieve their final product. Here I will show you my method for creating liquid soap using glycerin in place of water. 9/4/13 - ETA: I have had several people ask for the formula I used for this tutorial. Since this is a formula that I carry in my line of soap products I cannot give the exact formulation. However, I can tell you that this tutorial uses 20 ounces of oils (14% hard oils, 86% soft oils) calculated Potassium Hydroxide and glycerin amounts. As usual, always run your formulation through an appropriate lye calculator. Step 1: Calculate your water and potassium hydroxide amounts. I use Brambleberry's Lye Calculator for liquid soap with a 0 - 3% superfat. If find their calculator works well for my formulations and I do not superfat above 3% as excess fats that cannot be saponified may cloud your soap. I also do not formulate with a lye excess which would require an added step of neutralizing the excess lye afterwards. 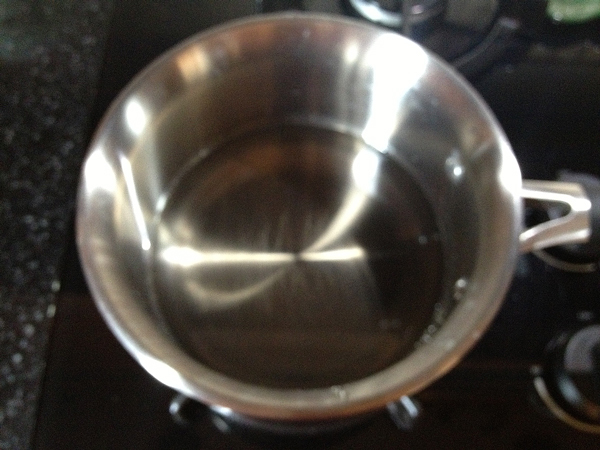 Step 3: Measure out your glycerin into the stainless steel pan. You will want this pan to be large enough to handle the bubbling up that will occur when you add your KOH. You do not want this to overflow your pot. Since I usually make small batches at a time, I use a 2 quart Stainless Steel saucepan. This size works great for about 12 ounces glycerin. Larger batches will require a larger pot. Make sure that it is stainless steel only. The Potassium Hydroxide will react with other metals or coatings. Step 5: Heat your glycerin until it reaches at least 200 degrees F. You must heat the glycerin or the KOH will not dissolve. ETA: You can also add your KOH to your room temperature glycerin and heat them together on very low heat. Doing so will prevent the danger associated with adding room temperature KOH to very hot glycerin as that is what causes it to puff up as seen in the video. Continually mix this with a stainless steel whisk or spoon until KOH is dissolved. Once the glycerin reaches 300 degrees F, I turn off the heat source and just let the KOH finish dissolving. Step 6: Once the glycerin has heated (my glycerin is usually 250 - 300 degrees F), you will SLOWLY add your KOH - small amounts at a time. Each time you add the KOH it will bubble up, then settle down. If you add too much at a time, it will bubble over. 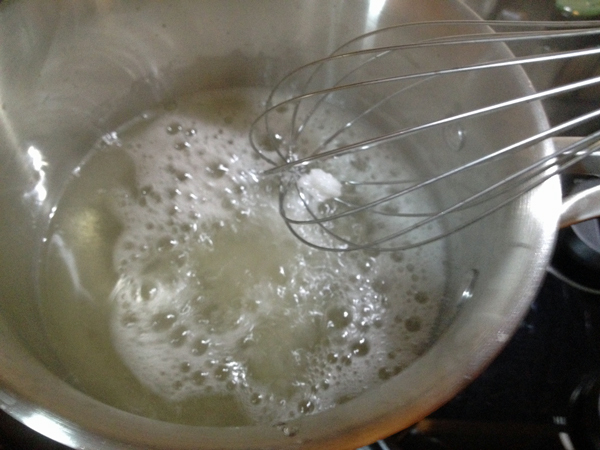 If your solution starts rising too high, remove from the heat and allow it to settle down mixing with a whisk. Step 6: Once all the Potassium Hydroxide has been added to the glycerin, stir with a whisk to make sure that all pieces have been dissolved. The solution may be a light amber color at this point but should be clear. Step 7: Pour the glycerin/KOH solution into your melted and heated oils and mix. 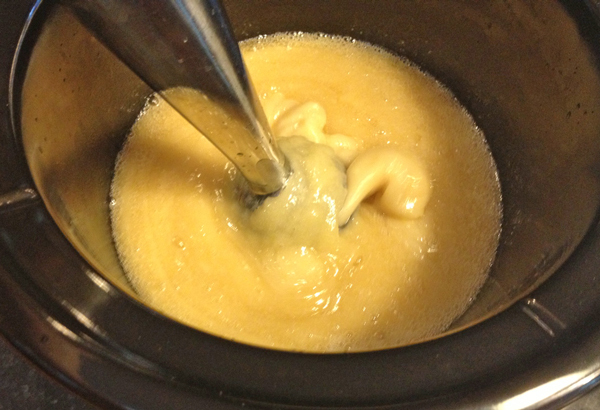 Using the stick blender, continuing mixing as your mixture combines and starts to thicken. This will happen fast. Depending on the oils used will determine what stages your will see during this process. Some recipes will go straight through to the gel or clear amber liquid stage very fast, others will just thicken. This recipe uses a high percentage of soft oils and therefore does not go to gel right away. For reference, a 100% olive oil formula using 20 ounces of oils takes about 10 minutes to get to a smooth slightly translucent paste ready for the cook. 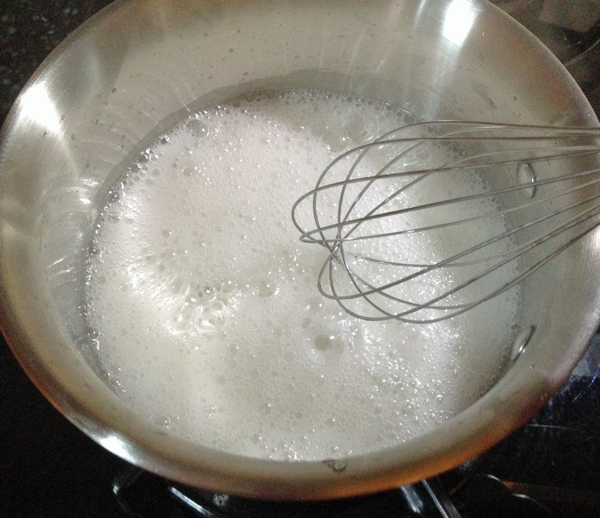 Step 8: As you mix with the stick blender or hand mix, you will eventually see small bubbles floating up from your mixture. This is more apparent if you use a whisk - so use a whisk in place of the stick blender every so often to test for bubbles. Now, if your formula is high in olive oil, you may not see these bubbles at all BUT you will see the paste go through the applesauce to thick gel in about 10 minutes or less. At this point, I set my crock pot to low and let it cook for about 30 - 90 minutes checking every 30 minutes and testing with Phenolphthalein Drops. One thing to note here - If you stick blend for too long thinking you have not reached trace or the cook stage, you will end up with an opaque layer of foam on top of a clear liquid on the bottom or a thick and somewhat fluffy opaque glob. This is ok and your soap will still dilute properly. The higher your hard oils, the more likely this is to happen. To avoid this, do not over mix your paste with the stick blender. Let the tiny bubbles fly then leave it to cook. Remember, the glycerin method is very forgiving. This recipe will look like very light caramel color at this point and is not translucent. Also note that you should not have to cook the paste for hours and hours - using the glycerin method greatly shortens your cooking time which is one of the main reasons people use it. If you find you are needing to cook for a several hours to get a clear Phenolphthalein test, check your calculations to make sure you do not have a lye excess. Test your paste with Phenolphthalein Drops every 30 minutes to determine if all your lye has been used up to saponify your oils (no excess lye). Clear to very pale pink is good. Step 9: Once your paste tests clear, turn off the crock pot and let sit overnight. In the morning you will have a paste that may or may not be translucent depending on your formula. This formula creates a caramel colored paste. Step 10: Test for excess lye with Phenolphthalein Drops if you have not done so during the initial cook and test for clarity by diluting a small amount of paste into boiling distilled water. This recipe was diluted at 1 ounce paste to 3 ounces distilled water. At this point I test the sample soap with my digital pH meter. This measures out at 9.6 which is an acceptable pH for liquid soap. pH may naturally lower slightly on its own during sequestration too - don't be too quick to add borax, boric acid or citric acid if you have not formulated with a lye excess. Please note that pH reading accuracy is affected by soap concentration and heat and you can get false readings in too concentrated a soap. Dilute to a 1 - 10% soap solution to get the most accurate readings. Step 11: Dilute your paste as you normally do - slow and with patience. Many people dilute too quickly and add too much water causing over dilution and very thin soap. Patience and adding boiled distilled water in very small increments is key. You will find that soap paste made using the glycerin method will dilute at a much faster rate than with the water method and is often creates a slightly darker soap. As always, keep your desired concentration of soap in mind when you dilute your paste. Less dilution water, higher concentration of soap. Too high a concentration of soap and you may find that you waste a lot of your soap. Think about the concentrated forms of products you find in the stores that you need must dilute with water before use. That is what can happen if your soap is not diluted enough and you end up wasting soap. Great tutorial-I've been making liquid soap paste and had heard about using glycerin but hadn't tried it. I think I will!Certainly looks like an easier process once you get the hang of it. Great tutorial, just curious, how many ounces of undiluted paste did this recipe make? I cannot remember exactly how many ounces of paste this formula made since it is fully diluted, but I started with 20 ounces of oils including babassu oil, high oleic sunflower oil, jojoba oil, olive oil and castor oil. Typically 20 ounces of oils gives me about 32 - 36 ounces of paste. What a lovely tutorial. Can you please tell me how much glycerin need for this process as a percentage. The glycerin used to dissolve the lye is not calculated as a percentage. I use 3 x the weight of the KOH in glycerin when using all glycerin and no water. I find that any less than that and the KOH does not fully dissolve. Some people have used less than that, but I stick with 3 x the weight of the KOH. When you create your formulation, you will use a lye calculator to determine your require lye amount to saponify your oils. 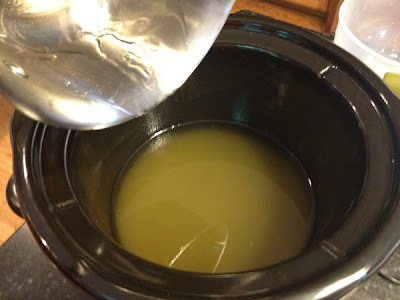 You will also get a liquid amount in order to dissolve your lye into. You replace that liquid with glycerin. Soapcalc.net calculator will default to 2 x the weight of the KOH, summberbeemeadow calculator will default to 3 x the weight of the KOH. When using distilled water to dissolve your lye, you can go with either amount or anything in between or even more than 3 x the weight of the lye. More water = more fluid paste, less water = quicker trace but stiffer paste. When working with water it comes down to personal preference, when replacing the water with glycerin you have to take into account using enough glycerin to dissolve the KOH - again, I find 3 X the weight of the KOH works best. Can I make Goat's Milk Soap using this method? Could I replace the glycerin with Goat's Milk? Thank you! I want to try this method since it seems much easier than other methods for making liquid soap:) Thank you! I used Brambleberry calculator to create a liquid soap with 100g apricot oil, 150g grapeseed oil, 300g virgin coconut oil and 220g olive oil, i used the stick blender to mix them but it kept watery. When cold it transferred to very thick gel and a creamy layer on the top. i used glycerin instead of water. HI Rouba - it is not uncommon for your paste to remain very fluid using the glycerin method. Also, if you stickblend too much using this method you can get a layer of thick foamy paste on the surface and a clear, darker more fluid paste beneath it. If this happens, do not worry as your paste will still dilute just fine. that my first time doing soap. Help! I am having such a hard time. I did the glycerin base with a mixture of hard and soft oils and a low precentage of oils with unsaponifiables. When i added my koh glycerin solution to my oils it seemed like it went throught at the stages but it never fully reached the mashed potato phase. It stayed like a thick pudding. I thought it was too hot so i turned the crockpot down. Then i read in the comments that it may stay fluid. So from there i let it sit for and 1.5 hrs when i checked on it, it had separated. It was a dark amber on bottom and a butterscotch color on top. So i used my stick blender again to mix them up and it turned back to a lighter shade of butterscotch. Did i not mix enough? I was mixing for an hr before i let it sit and it never got to any of the other phases. When i did a clarity test it immediately turned cloudy. So i know it needs to cook more but i used the glycerin method specifically for the amount of time it took and at this point i am over 3hrs. I checked my recipe and know i followed it to the T. What could i have done wrong? Using 100% glycerin in place of your water for your lye mixture should not need a 3 hour cook. Glycerin will speed up the entire paste making process. The separation you refer too sounds more like over-mixing. If you stick blend glycerin method paste too much, you may end up with two layers, a darker fluid layer on the bottom and a lighter foamier layer on top - this can happen but does not affect your final diluted soap. At this point, if your clarity test is cloudy, it may be your formula. Too high a superfat or too many oils with unsaponifiables can create cloudiness. Also make sure you are using distilled water to test for clarity with. Tap water can have sodium, calcium, magnesium, etc that will affect your clarity test making it a whitish color. Also, oftentimes that minor cloudiness will clear up as your soap sequesters for a few days to a few weeks too. Hard to tell without knowing your formula and seeing a picture of it. Ok heres what i did afterward...i turned it off for the night and it hardened up into a paste but at that point it was still zapping my tongue (i know this isnt full proof). The next day afterwork i let it cook for an additional 6 hrs and i turned it off. It was still testing cloudy, which may be due to the fact i was using tap water and our water is very hard here in California. But it didnt zap my tongue or make my skin itch when i washed my hands with it to test it so i took that as it was finally finished cooking. Also after checking on the unsaponifiables i did use avocado oil and mango butter. The other oils i used were castor, coconut, olive, medowfoam and plam kernal and i super fatted at 2%. I made a small batch today using just coconut oil and lard. I did use distilled water to dissolve my koh and it went through all the phases as expected this time which was very exciting. I took your advice on using distiled water and i used tap water and there was a difference. My tap water came out super cloudy but the distilled water was clear as a bell! Thank you for that tip! I will try the gylcerin method again without oils that have unsaponifiables and see how that comes out. Will let you know the results. Thank you so much for the response! Your tutorials have been awesome in helping me through this process! The avocado oil and mango butter can give you a cloudy soap due to the unsaponifiables that will remain in your soap. 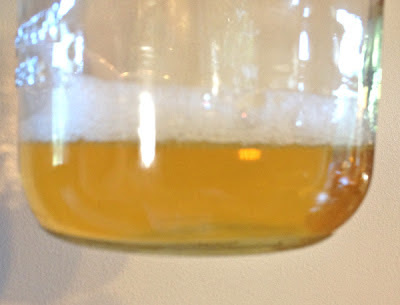 You can let it sequester for a few weeks and oftentimes the unsaponified particles will settle to the bottom and you can then attempt to strain them. Using tap water to test for clarity is not a great idea as that can oftentimes give you a whitish soap depending on the mineral content in your water. It is not uncommon for soap paste to be fluid while hot then harden up once cooled - perfectly normal. Each soap paste will have different characteristics based on a variety of factors. The more liquid in the paste, the more fluid it tends to be, the more that evaporates out during a cook, the harder it can be. The choice of oils can also affect the consistency of the paste. As for going through all the phases - again, each formulation will be different and you may or may not visually see all the "typical" phases, especially when using the glycerin method. Depending on your oils, you may see none of the phases with this method. Hi there - I have never used that formulation from the video before but it does have a superfat of over 9% which is not good for liquid soap. For bar soap, the superfatted oils/butters are locked into the solid state of the bar soap. In liquid soap, those excess fats and oils will float around in the aqueous solution creating a cloudiness and eventually separating out. I also find it much easier to use at least 3 x the amount of weight of your KOH in glycerin or a combination of glycerin and water. 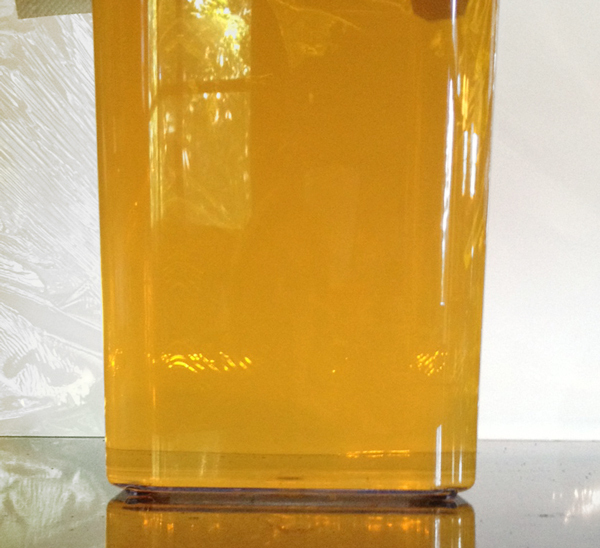 KOH does not dissolve completely in glycerin that is only 2 x the weight of the KOH. So for that recipe, lower the superfat (I would use 3.3 ounces KOH) and increase your glycerin to 10 ounces. Some people have luck with that video/formula (I am assuming it is the Soaping101 one) and many do not. Hello, im so devastated as this is my 2nd attempt in making liquid soap. My first attempt by using water really big failure as my soap didnt turn into paste at all even after 7 hour in crock pot. So i tried with using glycerin as most of soaper in the internet has a a great successmwith that method. But i dont know what went wrong...my soap still in liquid form after cooking it for hour. Please help me with this. Im now doubt my KOah was actually Noah.